Ever heard of Gyrokinesis? Most people haven’t, which is why we want to take a moment to explain exactly what it is. Gyrokinesis is a series of movements done either on a mat or a stool, offering total stimulation for the whole body. Sounds similar to Pilates, yes? 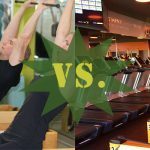 They do have their differences, and in this blog, we will discuss those similarities and differences, so you can decide which is better to choose for your workout. Gyrokinesis exercises began prior to adding in the equipment, so most classes use the basic exercises as a warmup before implementing any apparatuses. Once you have moved on to the equipment, you are now using what is known as the Gyrotonic Method, created by Juliu Horvath in the early 1980’s as “Yoga for Dancers”. Pilates works to improve stability and increase overall balance, helping to relieve chronic back pain in the appropriate class. It promotes mindfulness throughout the entire form, encouraging awareness and presence in each posture and movement, many of which use various props and apparatuses to ensure proper form and stronger performance. Gyrokinesis encompases unique movements that address the entire body, focusing on energy pathways, the nervous system, and improving range of motion, strength, and movement. Like yoga, each movement flows into the next, moving through a natural range of motion without jarring the body, allowing for better balance, flexibility, and strength. Like Pilates, it can be practiced in groups or private classes with qualified trainers. Adjustable equipment allows for smooth transitions between movements, offering a harmonious pattern no matter the body type or individual needs. While both are complete systems of mind-body exercise, Pilates includes focus on precise movement and the entire center of the body, providing greater core stability, fitness, and more. It encourages stronger and taller posture, focusing on postural correction and alignment. Also, Pilates equipment is a more spring-resistant system. Gyrokinesis focuses more on connections to the body’s energy centers, allowing for a release through the circular process. The idea is to reshape the entire body by developing functional strength and coordination with the use of a weight and pulley system. Both Pilates and Gyrokinesis are wonderful physical practices to increase overall health and well-being. It’s important to do research to find the class, teacher, or studio environment that best meets your needs. 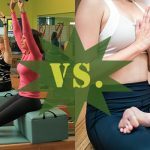 If you currently study Gyrokinesis or Pilates, talk to your teacher to find how to best combine the two. If you are interested in starting your Pilates journey, contact Dynamic Fitness today!